The same company that sews for THE NAVY SEALS is now manufacturing the ultimate in cell phone cases for the public. 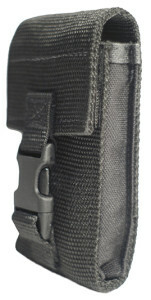 Chuck’s rugged cell phone case is made of ballistic nylon and features a velcro and buckle closure, sewn and bartacked using heavy duty nylon thread. Do not trust cell phone cases manufactured with second rate materials and workmanship. 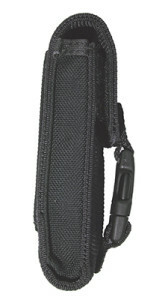 Attaches to your belt via the durable nylon webbing. To learn more about our company click on About Us. Dagwood Designs is known in the industrial sewing industry for delivering high quality goods. Chuck's Original Cell Phone Cell Case is no exception. 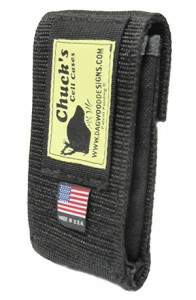 Order your Chuck's Original Cell Phone Cell Case today and you won't be dissapointed. You need a cell case that can handle the work you do. Keep your phone safe with our unique locking system. We make quality products for quality people. Known in the industrial sewing industry for delivering high quality goods in a timely fashion, Dagwood Designs is based on the belief that its customers’ needs are of the utmost importance. They work with many organizations ranging from small business owners and inventors to national corporations and government contractors to create custom carrying cases, bags, pouches, straps, leashes, outdoor gear and backpacks that meet the special needs of its clients.